At this time of year, you can use the Summer Triangle – and the constellation Cygnus the Swan – to locate the plane of our Milky Way galaxy. The three brilliant stars that make up the Summer Triangle shine way up high in the October evening sky. I suggest viewing the scene from the comfort of a reclining lawn chair, with your feet pointing southward. As seen from mid-northern latitudes, the stars Deneb and Vega hang high overhead at nightfall and early evening. 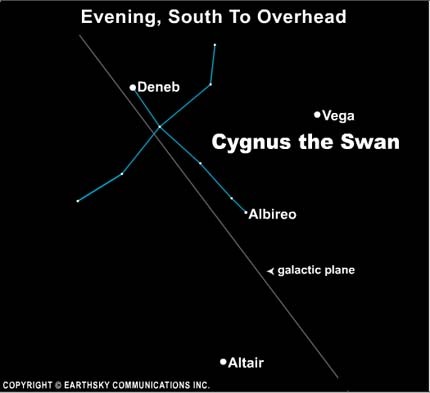 Vega, the brightest Summer Triangle star, shines to the west (or right) of Deneb, and Altair, the second brightest, is found roughly halfway between your southern horizon and straight overhead. As evening deepens, look for a modestly bright star to pop out in between Altair and Vega. That is Albireo, which depicts the Swan’s eye or beak. The line from Albireo to Deneb shows you the underside of the Swan’s body from head to tail. Three stars cross the body near Deneb to form what is known as the Northern Cross. Go one star farther out on each side of the Northern Cross to finish off the Swan’s wings. Extend the Albireo to Deneb line in either direction to soar along the galactic plane (equator). 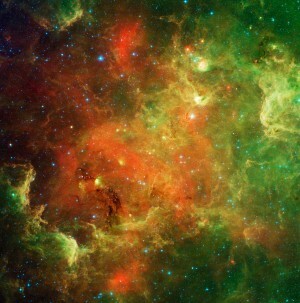 Through binoculars, you will see that star clouds, star clusters and nebulae abound on this great galactic boulevard! Locate the Summer Triangle first, then the star Albireo, and you have what it takes to find the glowing band of stars that we call the Milky Way! 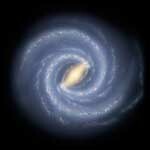 Will Earth pass through the galactic plane in 2012?